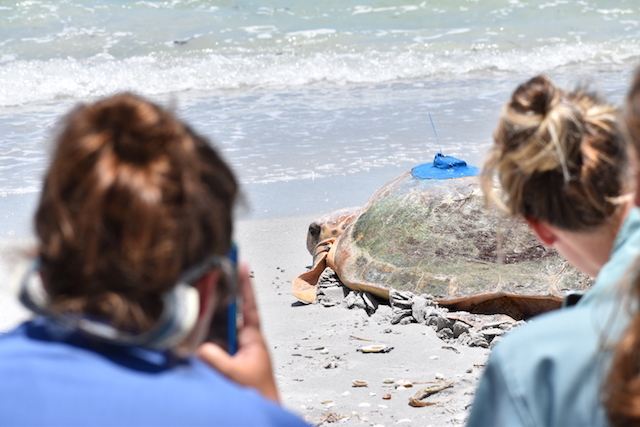 SANIBEL, Fla. (June 28, 2018) – An adult male loggerhead sea turtle was fitted with a satellite tracker and released at the West Wind Inn on Sanibel on Thursday following rehabilitation at The Clinic for the Rehabilitation of Wildlife (CROW). The turtle was reported to the Sanibel Captiva Conservation Foundation (SCCF) Sea Turtle Hotline on June 4 after he was observed struggling and rolling in the water near the shore. SCCF Staff, with help from volunteers, rescued the 230 pound turtle and transported him to CROW. 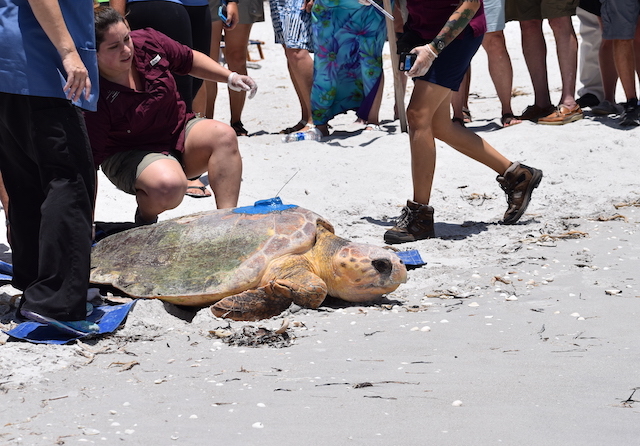 While at the clinic, the turtle was treated for brevetoxicosis, also known as red tide poisoning, using supportive care and a novel treatment as part of an ongoing study in collaboration with the Loggerhead MarineLife Center. This is the sixth sea turtle to be treated and released from the clinic for brevetoxicosis since January 1, 2018. Prior to release, he was tagged with flipper tags, a passive integrated transponder (PIT) tag and fitted with a satellite tag. The satellite tag is being deployed as part of the Sea Turtle Conservancy’s online sea turtle tracking educational program. Started in 1996, this program is a fun, educational journey through the science, research and geography of sea turtle migration using satellite telemetry. This turtle is being tagged in partnership with CROW, Mote Marine Lab, and Sea Turtle Conservancy. As part of the program, the turtle was also given a name. He was dubbed “Walter” in honor of CROW’s 50th Anniversary and its Founder, Shirley J. Walter. The satellite tag he will be fitted with is a Wildlife Computers SPOT tag, which transmits the turtle's location via satellite when he comes to the surface to breathe. Walter will be the seventh adult male loggerhead sea turtle tagged by Mote Marine Laboratory as part of a study of the turtles' migratory behavior after release from rehabilitation and recovery. 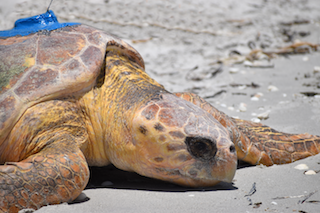 In addition, Walter will be part of Mote's broader study of the habitat use and home-range of adult male loggerheads in the Gulf of Mexico. Two more adult males are expected to be added to this study when released - Intrepid at Mote Marine Laboratory's Sea Turtle Rehabilitation Hospital and Coco from The Turtle Hospital in Marathon, Florida who will be tracked by the Sea Turtle Conservancy. The movements of Walter can be followed online at www.conserveturtles.org/turtletracking. Tracks of all the adult male loggerheads are available at www.seaturtle.org/tracking. Click Here to Check out Walter's Patient Profile while at CROW! UPDATE (September 14, 2018): Researchers have informed us that Walter's satellite tag is no longer transmitting. The last transmission was received on September 8. According to Sea Turtle Conservancy, "Not receiving data points could be due to many factors: the transmitter is not working for some reason, the transmitter has fallen off, the transmitter antenna has broken off or the batteries that power the transmitter no longer work. Ideally, the batteries in these transmitters can last for 8-10 months, but signals often stop prematurely. Ideas about why this is occurring range from problems with salt water getting into the device to turtles knocking the devices off as they wedge themselves under rocks. There have been examples of transmitters lasting no longer than a few days or weeks, but also examples of transmitters lasting for more than a year." 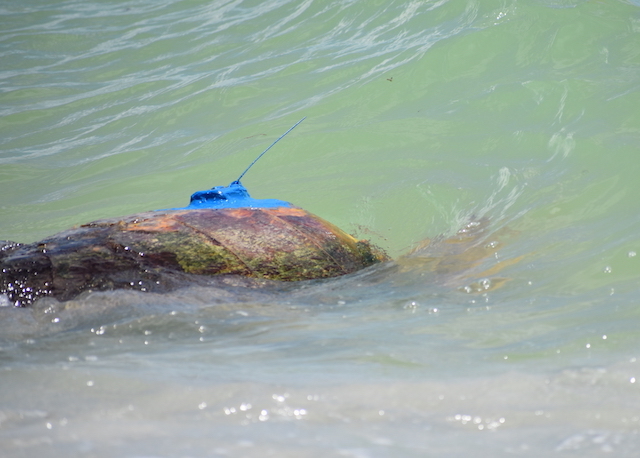 Walter's transmitter transmitted data for 72 days and the information he provided will help researchers learn more about the movements of male sea turtles. Check out one of the links above to see Walter's movements while he was transmitting! We wish all the best for Walter and may he live a long life!